Land Rover has been pitted in a battle with Jiangling about the X7 since before domestic manufacture of the Evoque even began in China in 2014. However, it is immensely difficult for foreign companies to win copyright lawsuits in China, and it seemed like Land Rover would join Honda, BMW, and Porsche in fighting these issues to no avail. However, Jaguar Land Rover prevailed, and Jiangling has now been ordered to discontinue the X7 and give JLR unspecified compensation for their losses. Chinese counterfeiting is a good part of why we haven’t seen any concrete concepts of the new Defender. The work on the X7 began in 2010 as soon as the LRX concept came out, which preceded the Evoque’s launch and was more or less a preview of its final shape. When the X7 went on sale in China in 2015, everything was there; the bulging fenders with the high forward cut line, the sloping beltline, the side vent, the iconic Range Rover floating roof, even the bold blocky model name on the forward edge of the hood, but saying "LAND WIND" instead of "RANGE ROVER." Soon after the X7 came out, there were kits to make a full conversion to an Evoque, largely masking the cheaper origins of one’s automotive purchase, unless you looked inside and noticed the similar, but chintzier interior. This comes at a critical time for Land Rover in China, as changing global trade has crashed the lucrative luxury car market there through the floor. Land Rover's bottom line has suffered an immense blow from this, and it's impacted operations globally -- even as sales are significantly up in North America and Britain. Any potential conversions of X7 sales to legitimate Evoque sales would be helpful, as would reducing damage to the Range Rover brand. The Evoque is manufactured locally for the Chinese market at the moment, to avoid steep import tariffs, alongside some of the other cheaper Land Rover models. The success of this legal case may be a significant factor in the future of this joint venture as JLR looks at where they can streamline costs. 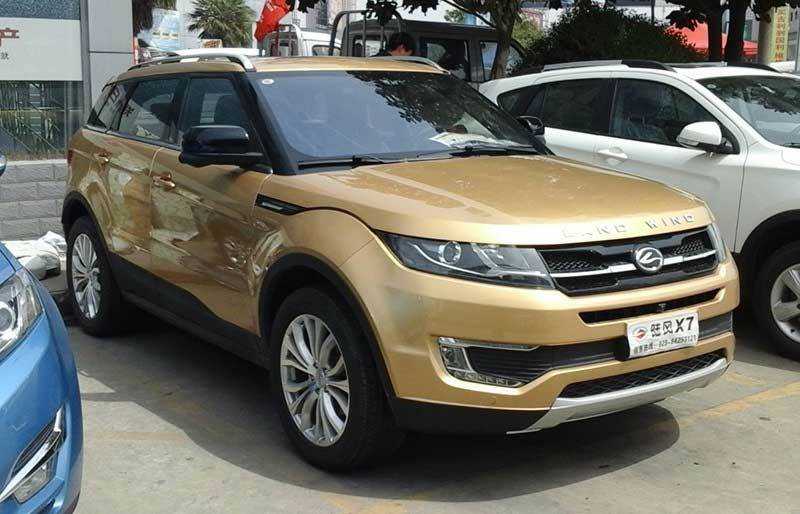 The Land Wind X7 was redesigned a few years ago to remove some Evoque-like traits, and ironically this case has been settled just as the second-generation Evoque hits the market. Nonetheless, it's an important victory for Land Rover to assert the value of their intellectual property.